Therapist Career with 5 different paths: Social Worker, Life Coach, Marriage Counsellor, Psychologist and Psychiatrist. Install all files (3) in your mods folder to add this new career to your game. This career mod requires Game version 1.48.94.1020. Has it always been your life's goal to help fellow sims? 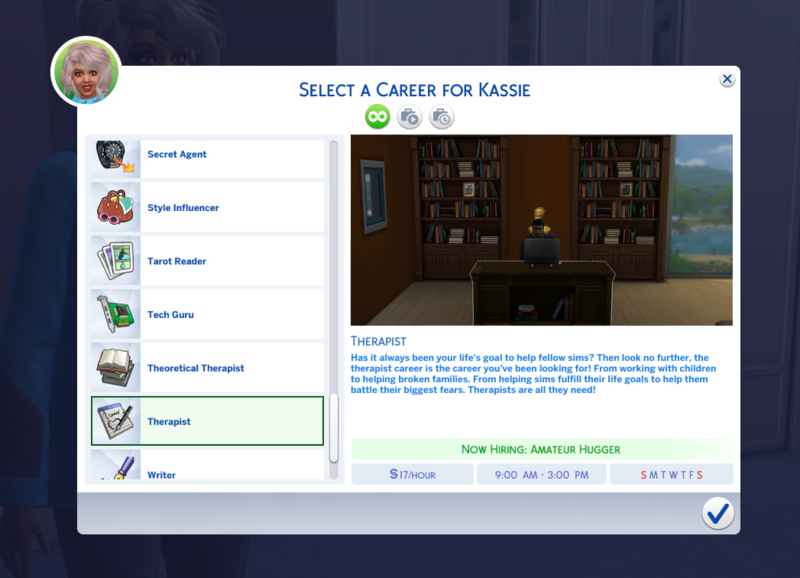 Then look no further, the therapist career is the career you've been looking for! From working with children to helping broken families. From helping sims fulfil their life goals to help them battle their biggest fears. Therapists are all they need! Still slightly awkward you hug your ways into the lives of people as an Amateur Hugger, making their day a tad bit better. You are now a well-trained Professional Hugger, improving the lives of many bypassers. Your first experience with mental illnesses. Suicide Hotline Trainees learn all the basics to be able to save lives. You are now a true Suicide Hotline Professional. You save many lives every day, with your positive attitude and lifesaving solutions. If you like working with families and helping children to have a better life, then being a Social Worker is the job for you. Social Workers focus their time on helping children with problems they have at school and at home. Talking to families and teachers is part of your everyday job. We all have to start somewhere and being an Intern is the way to go. You learn all the fundamentals to slowly work your way up towards a Social Worker Professional! Working as a Secretary for a real Social Worker Professional is a great way to learn. Not your favourite job in the world, but it helps you towards achieving your goal. It is time to deepen your information about being a Social Worker. As a Social Work Researcher, you learn the final bit of information to start for your own. As a School Social Worker, you help children with their problems on school. Bullying, bad grades, or other problems, you solve them all. Many problems of children start in their most trusted space - home. As a Family Counsellor, you visit families at home to talk about their problems and to solve them. 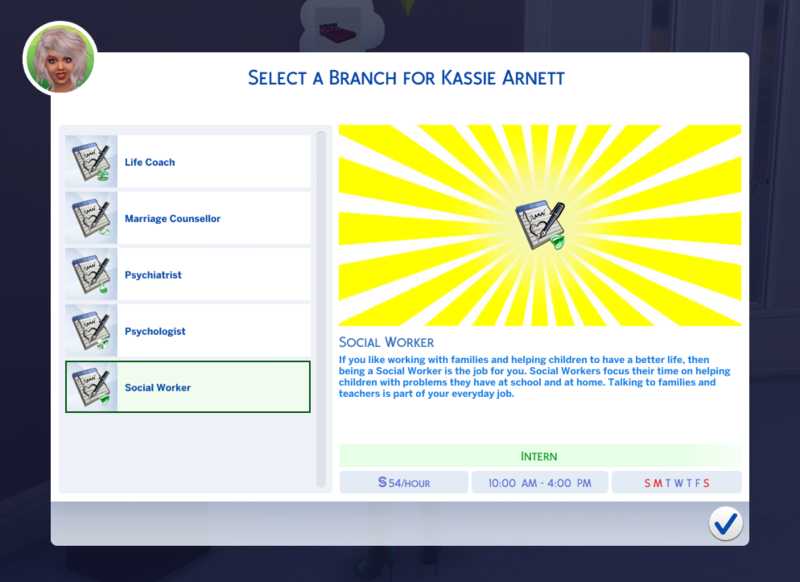 It has taken you many years and many experiences to get where you are, but you finally made your dream job - Social Worker Professional! You help children at home or at school, improving their lives significantly. 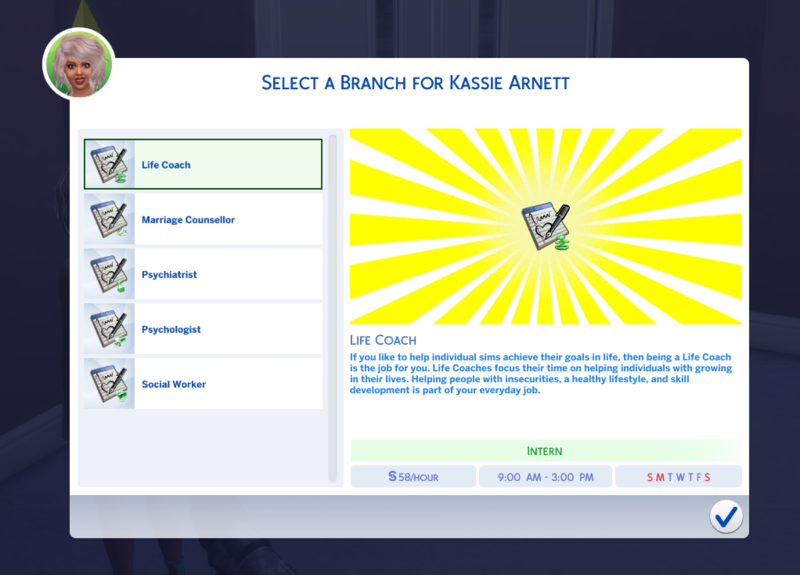 If you like to help individual sims achieve their goals in life, then being a Life Coach is the job for you. Life Coaches focus their time on helping individuals with growing in their lives. Helping people with insecurities, a healthy lifestyle, and skill development is part of your everyday job. We all have to start somewhere and being an Intern is the way to go. You learn all the fundamentals to slowly work your way up towards a Life Coach Professional! Working as a Secretary for a real Life Coach Professional is a great way to learn. Not your favourite job in the world, but it helps you towards achieving your goal. It is time to deepen your information about being a Life Coach. As a Life Coach Researcher, you learn the final bit of information to start for your own. There are many sims out there, whom have a low self-esteem. As a Self-Esteem Instructor, you improve their lives with valuable lessons. Skills are what bring people further in life. As a Skill Coach, you train people in all kinds of skills and help them achieve several goals. It has taken you many years and many experiences to get where you are, but you finally made your dream job - Life Coach Professional! You help individual sims achieve their goals in life, improving their lives significantly. If you like to help couples overcome their problems, and if you are an expert on dating, then being a Marriage Counsellor is the job for you. Marriage counsellors focus their time on relationships, families and single sims who could all use some help on the love part of life. Things like Couple Therapy, Group Therapy and Marriage Counselling are all part of your everyday job. We all have to start somewhere and being an Intern is the way to go. You learn all the fundamentals to slowly work your way up towards a Marriage Counsellor Professional! Working as a Secretary for a real Marriage Counsellor Professional is a great way to learn. Not your favourite job in the world, but it helps you towards achieving your goal. Not everyone is very good in dating and meeting people. 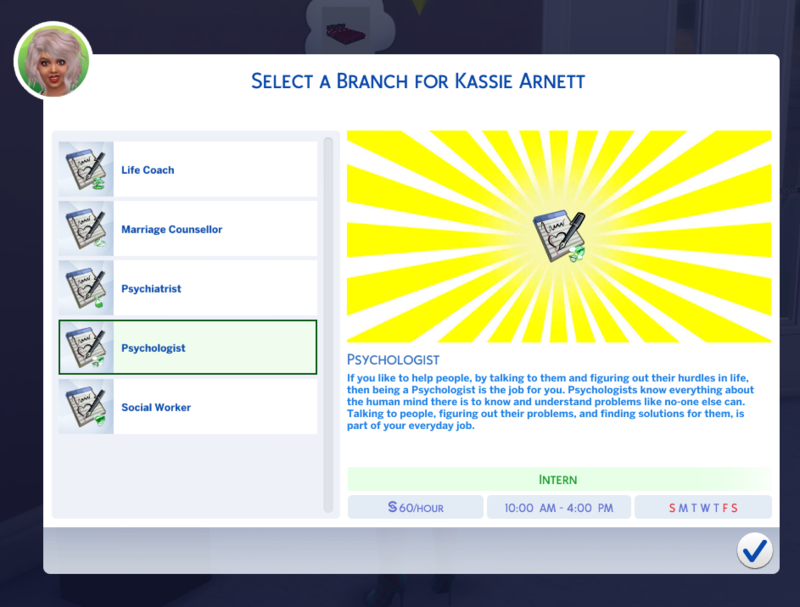 As a Dating Specialist you help those lonely sims who could use a little help from a true professional! Many couples, many difficulties. As a Group Therapist you consult many couples in one single session, making sure people learn from each other's problems and give each other support where needed and possible. A divorce can be hard on a family. As a Family Therapist you help guide the broken up families and let them find their separate ways, including making sure the children aren't taking the fall with their parents. 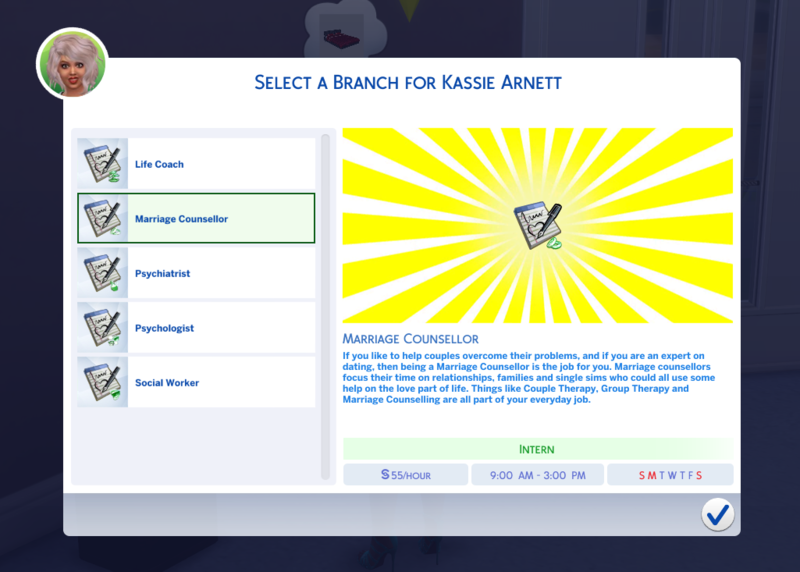 It has taken you many years and many experiences to get where you are, but you finally made your dream job - Marriage Counsellor Professional! You help couples overcome problems, and single sims to find love, improving their lives significantly. If you like to help people, by talking to them and figuring out their hurdles in life, then being a Psychologist is the job for you. Psychologists know everything about the human mind there is to know and understand problems like no-one else can. Talking to people, figuring out their problems, and finding solutions for them, is part of your everyday job. We all have to start somewhere and being an Intern is the way to go. You learn all the fundamentals to slowly work your way up towards a Psychologist Professional! Working as a Secretary for a real Psychologist Professional is a great way to learn. Not your favourite job in the world, but it helps you towards achieving your goal. It is time to deepen your information about the human mind, to become a proper Psychologist. As a Human Mind Researcher, you learn the final bit of information to start for your own. After learning all about the human mind, you are now officially a Human Mind Expert! You can now use this expertise to your advantage and teach those that aren't as knowledgeable as you. There are many reasons for sims to get anxiety and phobias. As an Anxiety Coach, you help them find and battle their fears, making the anxiety and phobias less of a problem in their daily lives. It has taken you many years and many experiences to get where you are, but you finally made your dream job - Psychologist Professional! You help sims overcome hurdles in their lives, improving their lives significantly. If you like to help people with mental problems, then bein a Psychiatrist is the job for you. Psychiatrists focus on previously known information about their patients, talk to them, and can diagnose mental illnesses. Having sessions with people, figuring out problems and mental illnesses, and prescribing medication if applicable is part of your everyday job. We all have to start somewhere and being an Intern is the way to go. You learn all the fundamentals to slowly work your way up towards a Psychiatrist Professional! Working as a Secretary for a real Psychiatrist Professional is a great way to learn. Not your favourite job in the world, but it helps you towards achieving your goal. Stress usually has many underlying problems. As a Stress Coach you find out what those problems are, and help sims reduce stress in their daily lives. As an Information Analyse, you analyse a patient's medical and social history for a Psychiatrist Professional, making sure they have all the information they need about their patient. You've learned pretty much everything there is about sims, including how to read past information and apply it to the present. As a Diagnostician you are now able to recognize and diagnose sims with mental illnesses and treat them accordingly. It has taken you many years and many experiences to get where you are, but you finally made your dream job - Psychologist Professional! You can analyse sims, diagnose sims, and you are able to prescribe medication if applicable, improving their lives significantly.